TubeNet • View topic - What constitures a professional tuba? What constitures a professional tuba? What makes a horn "professional quality"? What horns do you own that you consider professional quality? 1. Gives me a tone quality I like. 2. I can play it in tune. Re: What constitures a professional tuba? A player using it professionally. Re: What constitutes a professional tuba? EdFirth wrote: A player using it professionally. I've seen people making money using some pretty crappy horns. ...just as I could run a similar poll with my own instruments listed, and receive some "crappy" votes. A friend of mine who - like me - sells, repairs, and plays tubas wrote: Every tuba has someone's name on it. Professional is a horn that works as intended, reliably. It can be stamped out in china from pot metal or hand-made in Germany, as long as it plays well for its intended purpose I think it is suitable for professionals. Labels that say professional are a solid indicator of lower quality though, it reeks lack of actual confidence in the product. You won't find the word on any German manufacturers' websites. I got paid more while playing a 2-valve G contra than while playing anything else. So that's "professional". My 60-year-old detachable recording bell 3+1 comp. Eb ropes in several thousand bucks each year (and any of my other tubas would render each-and-every one of those particular jobs a bit more difficult, JUST AS the NOT using some of those OTHER tubas at the jobs on which THEY are specifically used would make THOSE jobs a bit more difficult). It's not very shiny, and I'm not going to reveal what I paid for it. No...it wasn't made it China. I would love to own a fixed-upright-bell similar new one that I've been selling that IS made in China. As soon as someone attempts to connect "just how good" and "professional" in meaning, agreement in definition of the word, "professional", flies out the window. We've all seen/heard/whatever people being paid "as professionals" and doing marginally-acceptable to unacceptable work, and we've all seen/heard/whatever people doing nearly unimaginably extraordinarily amazingly fine things as "amateurs" for no remuneration at all. I have noticed that the people who cannot seem to embrace this linguistical fact tend to be those who are "degreed", "certified", and the like, and possess pieces of paper that (more than the fact that - simply - they do what they do for remuneration) they personally believe define them as "professionals". Especially seeing that 3 of the 4 only have FOUR valves - everybody knows it can't be professional unless i has 5 or more valves. And Frankentubas can never be professional. Tell that to Don Harry who also has an old Lyon & Healy frankentuba. Joe, I think all of yours qualify as professional in anyone's book. Isn't the answer to this question dependent on the style of music being played? Classical as opposed to Jazz or Pop? If someone is playing Traditional Jazz on a beat up old Conn Sousaphone, his horn by the definition of many here would be considered a pro-horn because he is playing on it and making money with it. I'm sure this wouldn't fly if he showed up at an orchestra gig, so should we limit this discussion to what would be appropriate for playing and winning a job in a professional orchestra? The question seems too broad to me to get a meaningful answer that doesn't include a huge range of instruments. I don't consider myself a pro even though I get an occasional paid gig, but I'm interested in what the answers would be if the question was more specific. Radar wrote: Isn't the answer to this question dependent on the style of music being played? Classical as opposed to Jazz or Pop? If someone is playing Traditional Jazz on a beat up old Conn Sousaphone, his horn by the definition of many here would be considered a pro-horn because he is playing on it and making money with it. I'm sure this wouldn't fly if he showed up at an orchestra gig, so should we limit this discussion to what would be appropriate for playing and winning a job in a professional orchestra? The question seems too broad to me to get a meaningful answer that doesn't include a huge range of instruments. I don't consider myself a pro even though I get an occasional paid gig, but I'm interested in what the answers would be if the question was more specific. My jobs playing in jazz bands would be MORE DIFFICULT with a PT6 or PT15, than with my ̶r̶a̶r̶e̶ funky comp. Eb recording bass, so it cuts both ways...and - even if the Eb would still be the easiest to PLAY - if some jazz band job involves STANDING UP in a park (etc. ), I'll be taking the sparkly BBb sousaphone instead...i.e. There's "easy", but there's also easy. Terry, I'm sure all of your tubas are great. I wouldn't vote any of them down. My point is that you could probably find four individuals on TubeNet who would down any one of those four, and the same goes for individual *instruments within my own herd of elephants that others might quickly cull. My instruments have all been choosen because they all make certain types of jobs very easy (for ~me~) to perform. As I've explained before - even if one of them is extraordinarily fine and I absolutely love it, if one of them in particular collects too much dust, it is offered up for sale. Mrs. bloke has given me a generously-sized room for my tubas, but - even so - it ain't that big. Last edited by bloke on Thu Apr 18, 2019 11:06 am, edited 2 times in total. Bnich93 wrote: Labels that say professional are a solid indicator of lower quality though, it reeks lack of actual confidence in the product. You won't find the word on any German manufacturers' websites. I interpret "professional" as something that is the "real deal," and intended for regular and heavy use over a long period of time. A professional tuba player is someone who plays the tuba a LOT. A "professional tuba" is a tuba that is suitable for use under those conditions. In another context, maybe consider the difference between home and commercial restaurant equipment. The home stuff is built well enough and will do just fine... but the professional equipment is made for heavy use (all day, every day), and in more demanding situations. It's also probably a bit less "friendly" than the home equipment, and takes more time and training to learn how to use it. But, with the proper experience, it will do far more than the home versions could ever do. A commercial oven in my kitchen is going to burn and destroy all everything I cook. My home oven is going to be useless in a restaurant. Or, like construction tools. Everyone has SOME tools at home, and maybe even some very high quality things called "pro" or "Professional." Same thing there... they require more skill, training, and experience to use them properly. The benefits may or may not be immediately obvious over the "home" version of the tools, and it depends on the user. Do I need a $1,000 drill? No, my $100 drill will do just fine. Maybe the $1,000 drill would work a lot better and make 1% of the things I do easier... but I also know that if someone has to use a drill every single day, in high-demand situations, that $100 drill is going to be garbage to them, even if it was built well. bort wrote: I interpret "professional" as something that is the "real deal," and intended for regular and heavy use over a long period of time. A professional tuba player is someone who plays the tuba a LOT. A "professional tuba" is a tuba that is suitable for use under those conditions. Art (or reading/playing sheet music...which imitates art...ie. exhibiting a very high-level of craftsmanship) reflects our feminine side. I'm not sure that (prior to being married) if someone described a woman (re: a blind date situation) as "sturdy", that I would have been particularly interested in meeting with her. Moving back to the realm of tubas, I tend to view many Swiss-made instruments as "sturdy". In another context, maybe consider the difference between home and commercial restaurant equipment. The home stuff is built well enough and will do just fine... but the professional equipment is made for heavy use (all day, every day), and in more demanding situations. It's also probably a bit less "friendly" than the home equipment, and takes more time and training to learn how to use it. But, with the proper experience, it will do far more than the home versions could ever do. When I first received my (brand-new early 1980's) GDR-made F tuba, which was brought to me by someone else from Europe, it looked "cheap" to me...because it was somewhat plain in appearance. The fact that (skirting USA resellers) my cost was low also biased me towards viewing it as "cheap". I soon realized, however, that it is not "cheapLY" made. In fact, that same person (a tuba player) over-and-over was trying to convince me to purchase an Alexander F tuba (as they owned one of those)...No...just "no". Since that time (the better part of four decades), it has received a tremendous amount of use, but very little wear-and-tear. It is - however - delicately made, as (with 6 valves) it weighs less than the 5-valve look-alike instruments (other than being fancier-appearing) manufactured in that location today. It typically requires considerably more skill to manufacture something light/strong/durable than it does something heavy/strong/durable - particularly when the light and the heavy are made from the same types of materials. Categorizing tubas as "professional", by sturdiness, number of valves, length, or even build quality (as I've seen plenty of carelessly-assembled instruments imported from Europe that people paid well over $10,000 to acquire) - again - is going to result in little more than disagreement. 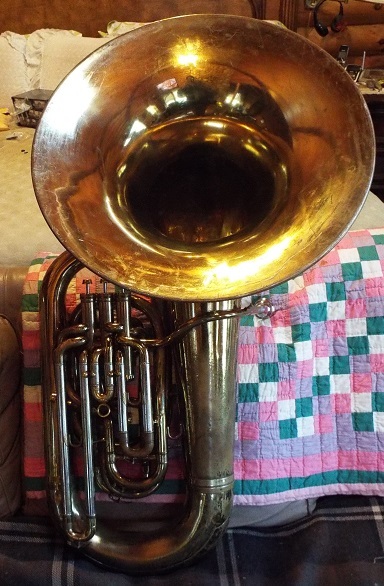 AS JUST ONE EXAMPLE...If someone is looking for a 7/8ths size Bb "quintet" tuba, what - really - is much better than an Olds O-99-4 (which were sold - by the hundreds - to secondary schools...oh, and virtually all of which seemed to have been assembled with extraordinary care)...? ?